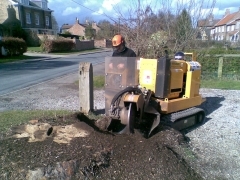 We offer a full stump grinding service with narrow access machines also available. To allow for replanting or reinstatement. To stop regrowth from stump or root system. The removal of trip or mowing hazards and unsightly stumps.